Posted on Fri, Mar 16, 2012 : 5:29 p.m.
A worker on a hydraulic lift truck on Friday cuts away at a large tree that fell onto a house in the 7500 block of Huron River Drive in Dexter during Thursday's storm. The tornado that ripped through Dexter Thursday was a massive storm nearly a half-mile wide in some places, packing winds of 130 to 140 mph, the National Weather Service said Friday afternoon. It left a path of destruction 7.2 miles long. The powerful tornado was rated an EF-3 on the weather service’s Enhanced Fujita scale, which ranks storms from 0 to 5. It had a maximum width of 800 yards. That makes the tornado very unusual, said AccuWeather meteorologist Brian Edwards, especially for March. "The majority of them are low-end ones," he said. "You start getting into significant damage at 3, 4 and 5." Storms of that intensity are much more rare, he said. The tornado was also unusual in that it was wreaking its havoc on the ground for about 30 minutes. "That’s a very long time to be on the ground. A lot of tornado touchdowns are very quick," Edwards said. The typical tornado is about 50 yards wide and has a path of about 1 or 2 miles, according to information from the National Weather Service. The storm damaged more than 100 homes, including 10 that were destroyed; uprooted trees and felled limbs; and knocked out power to much of the Dexter area. The Dexter storm was especially rare in that it came in March, a time when tornadoes do not typically occur in Michigan. Typically the air is not warm enough in March to hold enough moisture required to create severe thunderstorms and tornadoes. 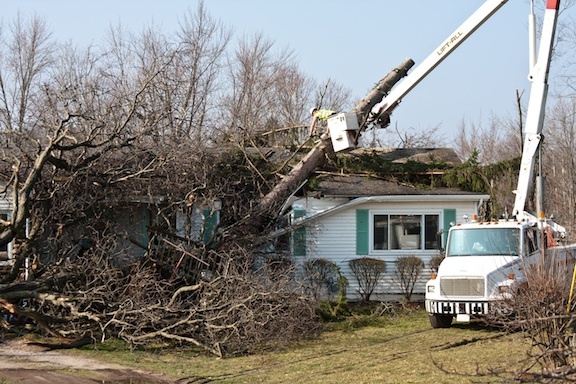 Southeast Michigan has had only eight tornadoes in March in the last 61 years, said National Weather Service meteorologist Cory Behnke. This week there have been four, including three Thursday. The other two tornadoes that struck Michigan on Thursday were smaller than the one that hit Dexter and not as strong. A tornado that hit Lapeer County was rated an EF-2, the weather service said. It had maximum wind speeds of 125 miles mph and had a path 4.5 miles long. It was 400 yards wide at its maximum width. The tornado that struck Monroe County was an EF-0. It had maximum wind speeds of 85 mph. It had a maximum width of 50 yards and path of destruction a half mile long. Tue, Mar 20, 2012 : 1:26 a.m. Sat, Mar 17, 2012 : 1:11 p.m. This is getting scary. If an F3 can strike in March, what will the summer bring us? I'm just glad that no one died. Sun, Mar 18, 2012 : 1:53 a.m.
Also, if one wants to do a little research on historical records, F3 tornadoes are not only incredibly rare in March, but in Michigan in general ANY time of the year. The ingredients necessary to produce such a tornado is hard to do this far north. Nearly 80% of all tornadoes in Michigan's history are EF-2 or less (noaa climatology). This is truly an extraordinary event that will be studied by many researchers for a long time to come. Sun, Mar 18, 2012 : 1:44 a.m.
Normal fluctuations in the jet stream may explain the immediate cause of the warmth, but still fails to explain the absence of winter, and why artic oscillation was much stronger than predicted. Solar, geomagnetic, and volcanic activity all have heavy influences on the delicate systems such as ocean Ph levels which dictate much of the worlds climate. Consequently, we do not have enough evidence to support global warming as the cause of extreme weather, our current climatological records based on ice core samples simply do not extend far enough into the past to draw a conclusion to a planet that has been changing for billions of years. Sat, Mar 17, 2012 : 7:11 p.m. There is an explantion to this extended early season warm weather event. Part of it lies in the shift in the jet stream across the Pacific Ocean and what is driving that. The mechanism in place may not significantly change the next few months. Chances for additional outbreaks of severe weather will exist in the local area, Michigan and the Mid West because of that. Stay tuned and don't forget, we haven't seen the last snow flakes this season, either. Sat, Mar 17, 2012 : 2:27 p.m. Exactly! Meteorologists are at a complete loss with explaining the extended warmth we are having, NOAA has already projected well above normal temperatures for the next 4 months on their climate website. This severe weather is common in Louisiana, Arkansas and Mississippi in March but this far north is phenomenal. I personally believe this warmth is the start of a much bigger pattern shift in our climate. Sat, Mar 17, 2012 : 2:59 a.m. Sat, Mar 17, 2012 : 3:43 p.m.
Fri, Mar 16, 2012 : 10:55 p.m. So the tree fell in the 7500 block of Huron River Drive? Most likely, it's NORTH of Central Street, with a number like that. Immediately south of Central Street, all I remember on Huron River Drive are BUSINESSES. The house must have been close enough to the Cider Mill for that tree to fall. Its area hadn't been mentioned in any reports I've read so far. How are the apartments on Huron Street? I don't know any residents there, but thought Huron Street was a nice area to drive through. They're close to the cider mill, all right. Fri, Mar 16, 2012 : 11:10 p.m.
North west of Mast Road (NW of the bridge) Huron River drive is primarily residential. Fri, Mar 16, 2012 : 10:36 p.m. I'd like to see a map of the path. What I saw (afterwards) looked like a series of hops, but then I was on the ground. Sat, Mar 17, 2012 : 8:01 p.m. Sat, Mar 17, 2012 : 2:07 a.m.
Tornadoes do &quot;hop&quot;. The do not always stay on the ground for the duration. They can go up and down many times and that gives it that weird hopping look when looking at the path. Fri, Mar 16, 2012 : 10:24 p.m.
A maximum wind speed of 85 mph in the Monroe County tornado? I wouldn't think that wind speed would be strong enough to turn a car over on its roof. Blow down a tree, yes.